12th class and having physical fitness they are eligible to apply for this DSSSB Prison Warder jobs Recruitment online through DSSSB official website of www.dsssbonline.gov.in. Online applications for these Delhi DSSSB vacancies will be accepted from 01-Nov-2017 to 21-Nov-2017 for this Prison Warder Vacancy Jobs Recruitment 2017 Notification. Candidates will be selected through Physical Standards Tests, PET and Written test for this DSSSB Prison Warder Jobs Recruitment. 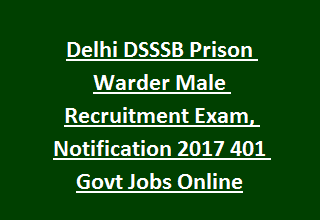 Exam pattern, Syllabus, PET, PST details, age criteria and other information is given below for this DSSSB Prison Warder Jobs Recruitment Exam 2017 Notification. Please Select First Tier PET/ Skill Test/Online Exam in official website. After Generating E admit Card link A pop up will open. Please allow pop up to open then only your E admit Card PDF will be downloaded. There are total 401 posts in this DSSSB Prison Department of Delhi State. Candidates age limits as 21-11-2017 for General candidates is 18-27 years and for others are relaxation is given below. Candidate must have qualified 10+2 or 12th pass from recognized board. Application fee is Rs.100 for General male candidates and for all other there is no examination or application fee. Candidates will be selected through written exam, physical standards tests and Physical Endurance Tests. Written Exam will be conducted for 200 marks. Total 200 questions will be given for each question one mark will be given. Download Exam Syllabus here for Prison/Jail Warder Jobs Exam. Candidates who are physically fit and having necessary qualifications, they can apply for this Warder jobs of Delhi state prison department vacancies. Last date for applying this DSSSB vacancies is 21-11-2017. First check your email id. When u applied then DSSSB sends a mail to you. Please check mail id. Nahi rad huva abhi tak isi news tho aya hi nahi..
site is working allow pop in E admit Card page..
Praveen check ur mail. Your admit card sent to ur mail id. Please Select First Tier PET/ Skill Test/Online Exam in admit card page..
Height-170 Cms, for ST candidates Height is 165 cms.